They had to do this everyday! They went to the water wells and collected their family’s share of water in these large clay jugs, that kept the water cool even on the hottest days. They made the clay containers from their earth’s mud and collected that earth’s reserved water. They did this everyday, mastering the art of body balance, as they carried those jugs over their heads walking back to the city. They did this everyday, talked, walked, provided. Everyday, never once complaining, never once feeling the need to! 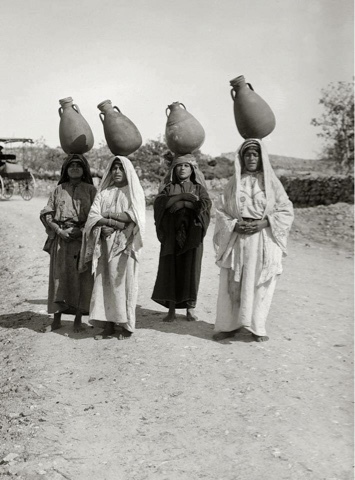 These are Women from the Palestinian city “Al Nasrah” (also known as Nazareth) in 1910. Like all the other women in all the other Palestinian cities and villages, they did this everyday! And now that we have the very accessible, always available, right at our fingertips, environment non-friendly plastic bottles of mineral, and vitamin fortified water to stay fit and healthy… we simply forget to hydrate! we forget what we had to do to get what we abundantly have now.